Nothing ruins a person’s day like snapping off a front tooth at the gum line. This Severna Park, Maryland resident called McCarl Dental Group at Shipley’s Choice when he broke his front tooth. Dental emergencies can happen anytime and our dentists do their best to make emergency dental care available as soon as possible. This patient was eating popcorn and bit an unpopped kernel. Although the patient was not in pain, he was embarrassed about his missing tooth. Dr. Jay saw the patient within an hour, performed a root canal, inserted a post and core, and then cemented the original porcelain crown back in place. The patients smile was restored. The patient commented that Dr. Jay McCarl is a very gentle, kind and exceptionally competent dentist. Here are photos of the dental emergency. 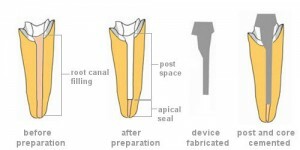 There are several steps for a root canal, post and core and re-attachment of a porcelain crown. After discussing options with the dental patient, Dr Jay explained the dental procedure and placed a rubber dam. Each tooth has a circulatory system. When a healthy tooth breaks at the gum, a root canal is necessary to prevent pain and infection. During the root canal procedure, the dentist removes the nerve, artery and vein from the center of the root of the tooth. The nerve, artery and vein are also called the pulp of the tooth. Root canal dental instruments are very small and the rubber dam helps prevent them from falling into the patient’s mouth. 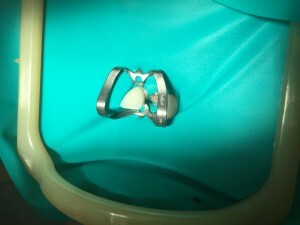 The rubber dam also helps prevent contamination of the root canal. The canal in the root of the tooth that is prepared by the dentist is also where the post is placed during the post and core procedure. The post and core procedure is necessary to anchor the dental crown. A dental post is a ceramic or metal cylindrical rod that is inserted into the root space of the tooth. The restored root of the tooth is prepared with a series of endodontic files to make room for the dental post. There is no discomfort or dental pain during this procedure because the nerve of the tooth has been removed. The core in a post and core dental procedure refers to a foundation around the post that the dentist builds to help with retention of the crown. 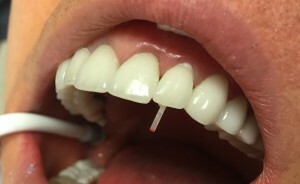 This picture shows the crown anchored in place with the dental post and core before the dentist removed the extra length of the post. 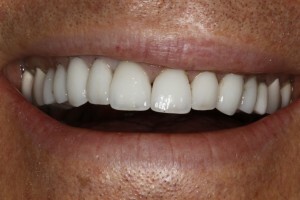 After the post and core, the dentist cemented the crown, removed the excess length of the post and polished the tooth. 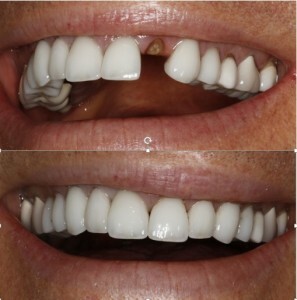 The dental patient was comfortable and delighted with his restored smile.